I like this plant a lot. From what I read about it a lot of people grow it from seed, but it's a perennial and so it must be sold in plant form too. I have never seen it for sale at a store though. This guy actually lays down on a blanket flower plant and then wraps himself up in it to demonstrate why it's called the blanket flower plant. Honey. Look! There's that homeless guy sleeping in our plants again! LANTANA: You see a lot of lantana in Trona and Ridgecrest and it's one of the most attractive low-growing perennials capable of surviving the conditions out here. Although this wouldn't stop me from planting it, I think it's worth mentioning that the berries produced by lantana are poisonous. If you eat them they can cause visual problems, vomiting, weakness, heart problems, and even death. The berries are most poisonous while they're still green. I doubt that adults would eat them, but small children might and so this might not be a good plant to have in your yard if you have small children. Another interesting plant that you see a lot around this area is datura or jimsonweed. The plant produces large, white flowers and does fairly well without a lot of water once it is fully established. The plant was actually used by Native Americans to induce hallucinations during religious ceremonies. The problem is that sometimes young people experiment with the plant and the outcome usually isn't pleasant. Death, painful and slow, is a common result of ingesting any part of the plant. tronagirl and wildrose: Another plant you see a lot of around here and that also happens to be poisonous is oleander. There are a lot of stories of people dying after eating a few leaves or after cooking hot dogs on skewers made from oleander twigs. I've heard that even honey from hives where bees collected a lot of nectar from oleanders can also be poisonous. All hope is not yet lost! There's still hope. You just have to be resourceful. 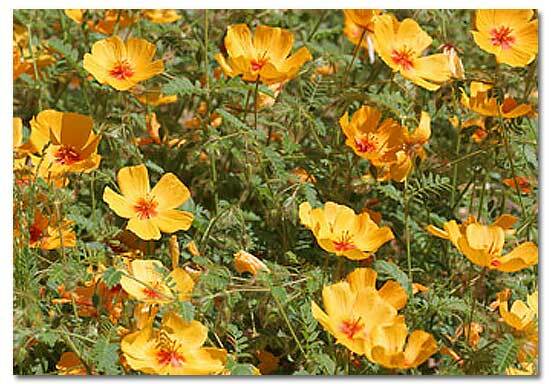 This plant is not a true poppy, but the flowers are reminiscent of the flowers produced by poppy plants. Kallstroemia is a member of the caltrop family, Zygophyllaceae, which includes the well-known creosote bush (Larrea tridentata). Another wide-spread, but not native, caltrop is the goat-head or puncture vine (Tribulus terrestris). This notorious plant’s Latin name means "scourge of the earth." With all the blabbering about the drought and how we need to save water you'd think there would be more being done in the way of making drought-tolerant plants available to the public. You'd think the state would be more proactive about assisting people in locating good plants to use to landscape their yards. Instead of threatening people with fines, why not just try to be helpful for a change! mrfish: Can't argue with your logic on this issue! The state is supposed to serve the people. A punitive state does not serve the people, it rules the people and that's what's known as tyranny. We fought a war way back a couple centuries ago against tyranny and now we're right back where we started. The state ought to be making drought-tolerant plants available to home owners and ought to be leading the effort to make more and new plants available. Sometimes it's hard to have patience with the idiots in charge!